Heinz opened their new European Innovation Centre in Nijmegen, the Netherlands in April. It’s the company’s largest R&D facility outside of the United States, and it includes spaces like a culinary kitchen for dreaming up new recipes, a pilot plant where researchers produce and test new products, flexible workspaces for employees, and—because this is Heinz, after all—a restaurant. But the real attention-getter is the art installation in the lobby. Acrylicize, the London art collective, designed and built the wall, dubbed “Wall 57” (after Heinz’s famous slogan, “57 Varieties”). The decision to build it came after discussions early in the design process about implementing some sort of art feature in the reception area. 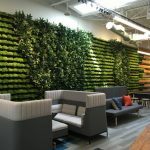 Strategy Plus (formerly DEGW), the interior architects on the project, floated the idea of a mixed media wall and the team tapped Acrylicize to make it happen. To make sure that they accurately portrayed the brand on the wall, the designers immersed themselves in Heinz history. All images courtesy of Acrylicize. Additionally, Burke said meetings with key Heinz personnel were “pivotal” in the research process. The designers distilled everything they learned into five key “pillars of innovation” to represent on the wall: packaging, production and distribution, marketing, iconic products and recipes, and brand philosophy. To form the layout, they stacked Heinz’s keystone-shaped logo multiple times to create a network of 57 windows, each telling an important story about the brand’s history. What has resulted is an expansive, interactive wall, built with everything from tomato seeds and ketchup bottles to household forks and refrigerators. We will be in Pittsburgh on June 29, 2017. Can we tour the company? Is there an area to purchase items?